This is it, people. We’re in the home stretch. Mother’s Day is coming this weekend, and I hope you’re all prepared. If you aren’t quite yet, make sure you check out a few of the recipes I’ve posted, like yesterday’s Orange Sticky Rolls with Cream Cheese Icing and these Twix Brownies. Both are baked goods sure to make Mom smile on her special day. I don’t believe I’m alone when I say baking something for Mom on Mother’s Day is a wonderful way to show her how much you care. In fact, Le Creuset has put together a special Mother’s Day Baker’s Set just to honor that special lady in your life (or you, if you’re the mom and baker). Making the perfect pie will be a snap with this set. 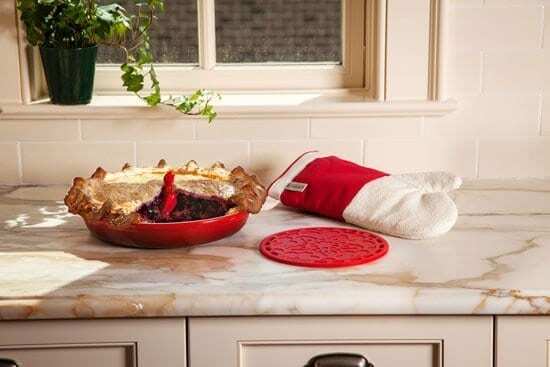 The generous 10″ stoneware pie pan will bake up your pie crust to flaky perfection, while the oven mitt and trivet will keep you both stylish and safe in the kitchen. Have you ever used a Pie Bird? They’ve been around since Victorian times. What does a Pie Bird do, you ask? This little ceramic animal is hollow, and funnel shaped. It supports the center of your pie so you don’t have any cave-ins, and allows steam to escape from the cooking filling so that you don’t have any boil-overs, and the filling will completely cook. Pretty genius, right? Not to mention adorable. The Le Creuset Baker’s Set comes all in Cherry – let’s be honest – the perfect color for loving sentiments. Stay tuned this week for one more fabulous Mother’s Day Giveaway! Want to win a Le Creuset Baker’s Set in the color Cherry? Here’s your chance! Remember to leave a comment for each item that you complete. Head over to Le Creuset’s website and tell me about one item you’re swooning over. Please be specific, example: I’m swooning over a 5 1/2 Quart French Oven in Coastal Blue. 1. Join both My Baking Addiction and Le Creuset on Facebook. Leave a comment below telling us you did so. 2. Follow My Baking Addiction on Pinterest. Leave a comment below telling us you did so. 3. Subscribe to My Baking Addiction’s email updates. This is different than the MBA RSS feed. When you click the link, you will see “Get My Baking Addiction Delivered By Email.” Once you subscribe to the email updates, you will get an emailing confirming your subscription. Leave a comment below telling us you did so. 4. Sign up here on Le Creuset to be the first to know about new items, colors and exclusive deals. -This giveaway is open to USA residents only and will run until Sunday, May 13th at 11:59 pm EST. -Winner(s) will be generated via a random number generator. Winner will be notified via the contact email provided on the comment contact form. -Winner(s) will have until 5/16/12 to claim their Le Creuset Baker’s Set or we will choose another winner. -Item will be shipped to the winner by Le Creuset. -This giveaway is in no way sponsored, endorsed, administered by, or associated with Facebook. This giveaway is provided to you by Le Creuset. The views and opinions expressed on My Baking Addiction are purely my own and based upon my personal experiences with Le Creuset products. I was given the product(s) free of charge; however, I was not monetarily compensated for this review or giveaway. I’m swooning over the 12 quart stock pot in Caribbean! I follow MBA and Le Creuset on Facebook!